From Sarah M. Eden, the USA Today Bestselling author of the Longing for Home series, LONG JOURNEY HOME is a new romance novel set in the beloved world of Hope Springs. I love this book! I love this whole series!! 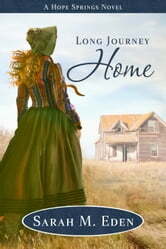 Hope Springs is a special place with real characters and stories that always pull at my heart. There are struggles, there is heartache, and there is so much love and joy. Maura is a wonderful mother that will do anything to help her son. She is kind, giving, brave and quite stubborn. Ryan is as good a guy as you will ever find. He is full of strength and has such a big heart. I loved watching the love between them grow. There is something very special about the O’Connor family. The way they love and care for each other is inspiring. They were a great blessing to Maura and Aiden and the reverse was true, as well. I hope we get to be back in Hope Springs with all of them soon! I received a complimentary copy of the book, which I voluntarily reviewed. I have given my honest opinion.